The QIDI printer weighs a bit more than 21 kg and is made with a metal frame. The dimensions are 18.3 x 12.6 x 14.76 inches. It can print objects in the measurement of 9 x 5.9 x 5.9 inches at an overall volume of 313 cubic inches. The plate is made from aeronautic grade aluminum, so there isn’t going to be any warping. The QIDI printer comes with what is called dual extruders. The dual extruders make it so that you can print in multi-colors and choose the layer of thickness you like. You can adjust the thickness from 0.1 to 0.3 millimeters easily. You can use the printer through an SD card or by hooking it up to your PC with a USB cable. Between buildings, you may need to occasionally recalibrate the printer, but you will be able to print 3D objects without failure. The printer will arrive mostly assembled. For the rest of the assembly, there are assembly instructions, which are easy to follow. You will have to open up the back panel in order to access the power supply and switch it over to US standard, and you will need to attach the dual extruder and the acrylic panels. Depending on your experience, the assembly process could take a couple of hours. After the printer is assembled, it will be ready to go. The printer comes with a spool of ABS and a spool of PLA to get you started. 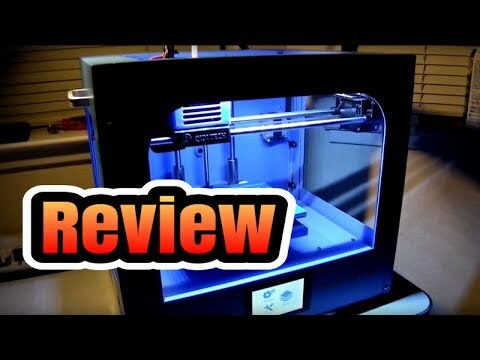 QidiTech X-One 3-D Printer Unboxing, Test, Review, and Repair! Before you operate the 3D printer, I highly recommend you reading the user manual that comes with it. Take my word on this one, by reading the user manual, you’ll gain a better understanding of how the printer works, which will make it easier on you. You won’t be able to run all of the programs on the printer all at one time, and this is something you will need to realize. So, if you have installed Python, MakerBot, and Replicator G software, you won’t be able to run those together – if you try to, then the PC isn’t going to properly read the connection. If you run into a problem, check to see if the computer is running any other software and close unnecessary programs that you see. Afterwards, your PC should recognize the printer. Speaking in the software, it is easy to use, so you shouldn’t have any problems with it. As an additional note, when you’re setting the printer up, don’t forget to mount the dual extruder to the cradle. Then, along with the plexi-glass walls, door, and top, mount the filament and the holders. Since the printer is fully closed, it makes the printing results much better when printing ABS filament. When you’re printing PLA filament, you should make the printer ventilated. The frame is full metal, which makes the printer strong and stable during the printing process. The metal platform is high heat resistant and is much better than the plastic supports that are on many of the other printers. If you’re looking for a good 3D printer that is under $1,000, then this one right here would be your best bet for all of the above reasons. The printer offers dual extrusion, which isn’t really something you find in printers within this price range. It’s easy to use, and the software is even easier.